I don’t much keep track of the metrics of running a website but occasionally I’ll notice what the traffic is like to certain things I post here, thanks to some of the tracking doodads WordPress supplies users. Frankly, I have been SHOCKED at the high volume of traffic my “review” of this Batman Happy Meal toy has received. It’s by far one of my most popular posts in the years I’ve been doing with this Island of Misfit Toys posting and the way I see it, I might has well move from strength to strength. This week, we’ll be looking at a similar fast food premium, created for Burger King in 2003. We’ll in fact be looking at two of them across the next half month, but I digress. These toys were designed to promote Cartoon Network’s Justice League cartoon series, designed by many of the same creatives behind Batman: The Animated Series. The Justice League cartoon series ran in two iterations throughout the 2000’s; this toy line is designed around the first of those two, spotlighting the seven original members of the superhero team (Superman, Batman, Wonder Woman, Green Lantern, Flash, Hawkgirl, Martian Manhunter) and their space mode of transport (The Javelin). Today we’ll be looking at Wonder Woman. As usual with fast food premiums, this toy comes to us in a plastic baggie emblazoned with the logo of the series, identifier of what toy your child is holding, and some other information including websites and such. It’s utilitarian, it does the job (more or less) and I don’t have much more to say about it beyond that. Once opened, the Wonder Woman figurine/toy is further protected by a plastic buffer/cushion which is a thoughtful touch for a free toy in a hamburger meal. As I mentioned in the Batman review, protection like this was rare on this caliber of toy. One of the great benefits to the DC Animated Universe style is that it translated very well in plastic… and this Wonder Woman toy is no exception to that rule. This toy comes with two distinct figurines and a base and all are sculpted well. As this toy is based around an action feature, much of the sculpt is done in service to those aspects. 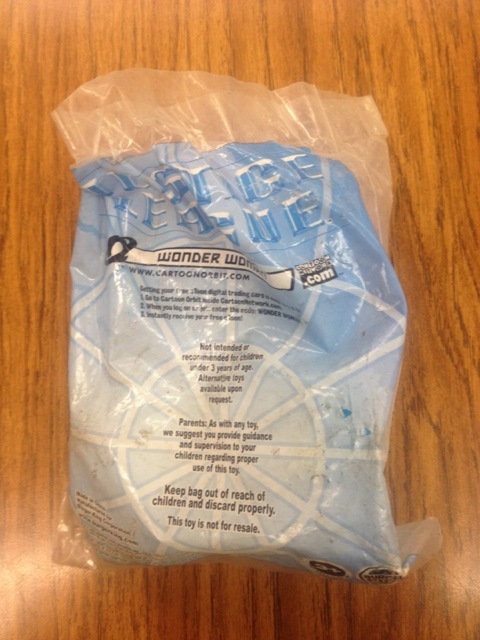 Much of the toy is done in solid plastic – blues for the base, clear plastic for the transparent bad guy. Much of the rest of the paint applications (flesh tone, red, blue, yellow, and black) are hit and miss. Don’t mistake me, you can tell this is Wonder Woman but the paint is pretty awful with a lot of slop. I also point out much of the black paint along the edges of Wondy’s black hair have rubbed off… but I’m going to give this toy a pass on that problem, as it’s over a decade old. I’ve seen Happy Meal toys that have held up better over longer time, but still. If the paint is rather ho-hum, the action feature built-into this toy forgives much. Wonder Woman is here using her Lasso of Truth to corral the see-thru baddie, which is a White Martian. 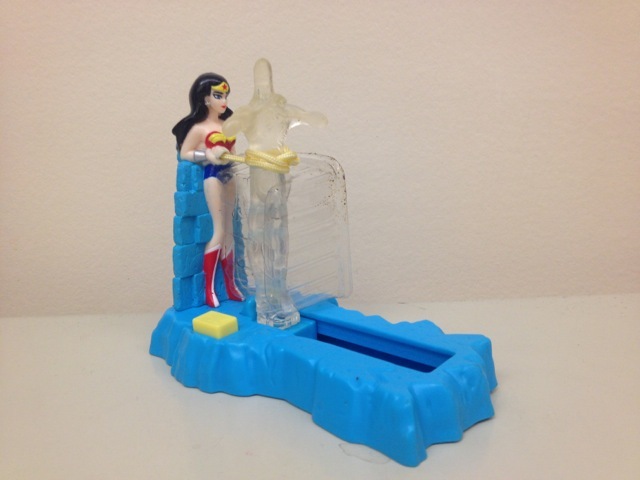 After locking him in place and deploying the button on the side of the toy, the lasso coils around the bad guy as it spins back toward Wonder Woman. It’s a hard concept to explain, which is why I took a little video of the feature. Beyond this feature, there is no articulation on the toy. The only accessory separate from the toy is a small comic book, and here I’m afraid my choice in toy has let you down a bit. Time was not kind to this toy and the pages of the comic book have, over the intervening years, bound together making it impossible to read. I am sure you can track down the contents of this comic somewhere but I’m sorry to say I have no clue whether or not it’s worth the effort. This is a fun little toy. I prefer the Batman figurine I talked about last time but as far as it goes, this is a fun toy to have sitting on my shelf. A rather cool and simple find this week, we’ll be looking at a fast food premium given away by McDonald’s restaurants during 1993 in conjunction with the premiere of Batman: The Animated Series. I picked this up at a thrift store for $2 bucks. One of my favorite quotes about McDonald’s was something Graham Linehan, the writer and producer of (among many things) the British sit-com The IT Crowd, said a few years ago. “Every time you have McDonald’s as a kid, it’s a victory. Every time you have it as an adult, it’s a defeat.” This is absolutely true and captures something I was thinking about when I found this Happy Meal toy. During most of the 1980’s, I loved Mickey D’s and would beg my parents to take us there for lunch or… dare I hope… DINNER. My order was always the same: The Chicken McNuggets Happy Meal. By 1993, I had pretty much aged out of Happy Meals… but I was a tremendous fan of Batman: The Animated Series. Simply put, it’s the best version of the Caped Crusader ever captured in any medium and I watched B:TAS faithfully every weekday at 4:30 on FOX5 out of New York City. 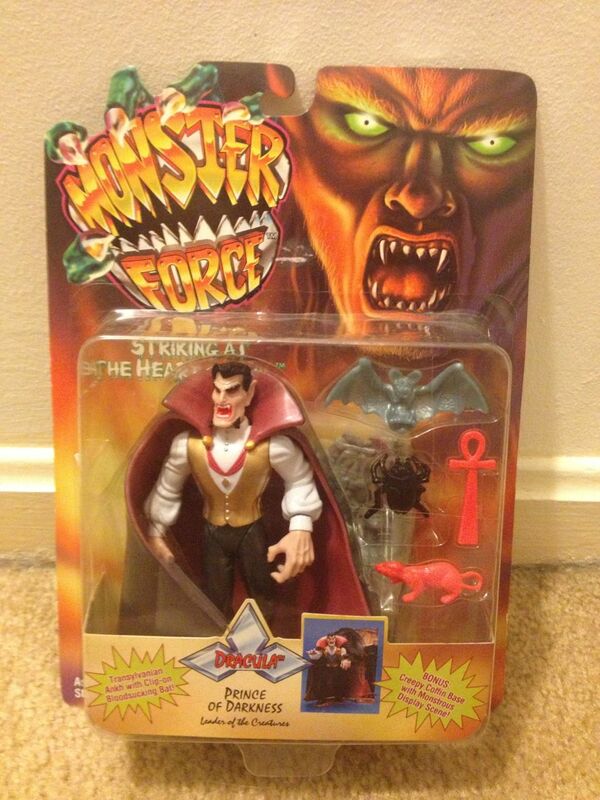 I was excited to find one of these fast food premiums… and arguably the best from the B:TAS Happy Meal promotion. McDonalds offered eight toys in all during this giveaway. 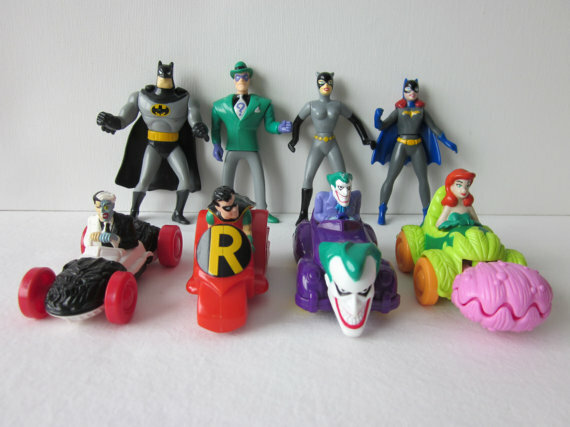 Four of them were Hot Wheels style vehicles featuring Robin, Poison Ivy, Two-Face, and The Joker. The other four Happy Meal toys were essentially small action figures, based on Catwoman, The Riddler, Batgirl, and the toy we’ll be looking at today, Batman himself. A very weird one this week, even for the Island of Misfit Toys. 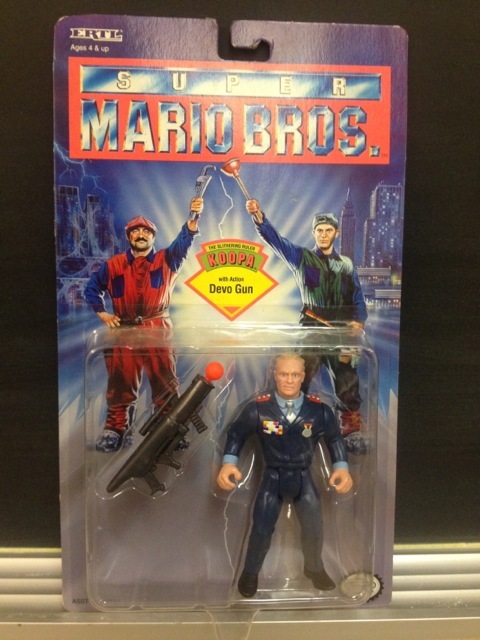 We’re looking at Koopa from Ertl’s Super Mario Bros. line of action figures, produced in 1993 to coincide with the live-action movie based on the ubiquitous Nintendo video game. I found this beauty at a trashy comic book show in a “3 for $5 dollars” bin. The Christmas creep is fully in effect on the Island of Misfit Toys, as we’ll be looking at Exclusive Premiere’s It’s A Wonderful Life George Bailey action figure. Yes, you read that right. Some company made a Jimmy Stewart action figure in 1997. Exclusive Premiere was a small toy company from the late 1990’s specializing in toys based on TV and film properties of yesteryear; movies like Casablanca and television shows like Happy Days, The Munsters, and The Honeymooners were all made into toys by EP. Further, these toys were made in a style that befit the nostalgic air of those properties. To wit, most of Exclusive Premiere’s output were 8 inch dolls with cloth outfits. These offerings are very similar to the Mego action figures that were very popular in the Seventies, although it’s clear that EP was a lot more exacting in their designs. I bought this George Bailey toy at a small comic and toy convention in New York State for $3 dollars. I honestly couldn’t believe my eyes when I saw it mixed in amongst the assorted garbage toys the vendor was selling. It’s so singularly strange. Yet… I must admit, I am the perfect buyer for this thing. I have a small collection of Christmas themed action figures that I decorate with every December and I love oddities born out of the 1980’s and 1990’s. Monster Force was a short lived animated series from the 1990’s produced by Universal Animation Studios. The show pit technologically equipped monster hunters against The Creatures of the Night, a catch-all name for some of the more famous ghouls. Since this show was produced by Universal, they had access to the “official” library of Universal Monsters brand were able to make several visual and narrative references to those classic films. I had never heard of the show before seeing this toy in a comic convention discount bin. I paid $3 dollars for this toy. We’re looking at Dracula, the de facto leader of The Creatures of the Night. This action figure was made by Playmates Toys, purveyors of lines such as Teenage Mutant Ninja Turtles and Star Trek, among many others. 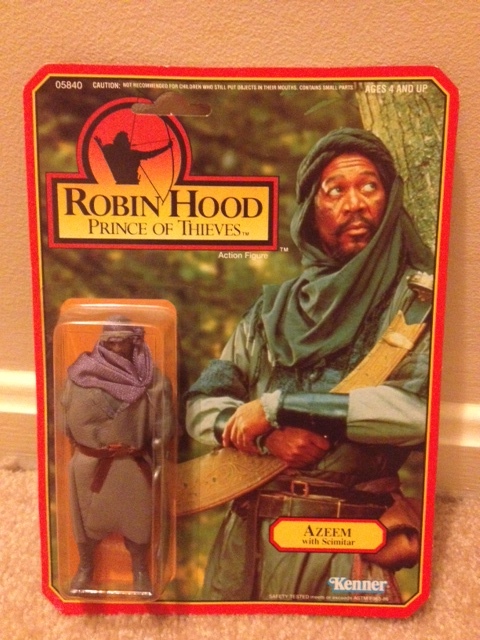 This week on The Island of Misfit Toys, we find Azeem from Kenner’s Robin Hood: Prince of Thieves toy line. Released in the summer of 1991, Prince of Thieves was a pretty laughable summer blockbuster starring Kevin Costner doing a weird faux-English accent as Robin Hood. I’ve never been a big fan of the film, but I will admit Prince of Thieves has some nice moments. Most of them are provided by Alan Rickman (doing a twisted take on the Sheriff of Nottingham) and Morgan Freeman’s wise, stoic Moor. The Prince of Thieves toy line harkens back to a simpler time when toy companies could get away with more to save money. The entire line of Robin Hood toys is a Frankenstein creation whereby Kenner Toys took existing parts and pieces of previously successful toy lines and retrofitted them awkwardly into a new brand. It seems the majority of pieces for these toys and vehicles were pieced together from Kenner’s Super Powers and Star Wars lines. 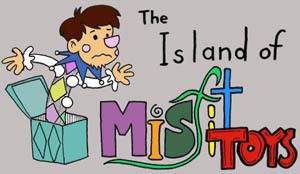 You are currently browsing the archives for the island of misfit toys category.